Selecting Option 506 for the E4428C ESG analog signal generator provides a 250 kHz to 6 GHz frequency range coverage. Two frequency range options are available to choose from for the E4428C ESG: Option 503 or Option 506 (250 kHz to 6 GHz). 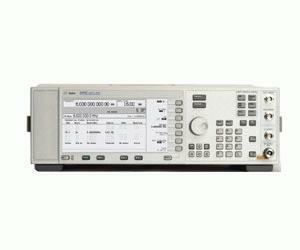 These choices provide ample resolution to configure the E4428C ESG to meet your specific RF test requirements. Option 506 is recommended for test cases that require CW and analog modulation baseband or RF test signals at or below 6 GHz carrier frequencies. Common uses include the generation of CW and analog receiver test signals in the cellular, ISM (2.4 & 5.8 GHz), and UNII frequency bands.